Do I need my passport to get to Hawaii? Since Hawaii is the 50th state, you won't need to bring your passport unless you're visiting from outside the United States or traveling to another country after Hawaii. As an international visitor, you will need a valid passport and visa to enter the United States. Please check with your official government agency to ensure you have the most current travel requirement information. Ensure that your passport is valid for six months beyond your intended period of stay. Citizens of countries participating in the Visa Waiver Program should be aware of the new passport requirements by the United States. Citizens of countries not participating in the Visa Waiver Program must have a valid visa to enter the United States. What should I pack on my trip to Hawaii? It's warm and tropical in Hawaii, so pack your summer and beach attire. You may want to bring a light jacket or sweater for the evenings. Suits and ties are very rarely worn here. 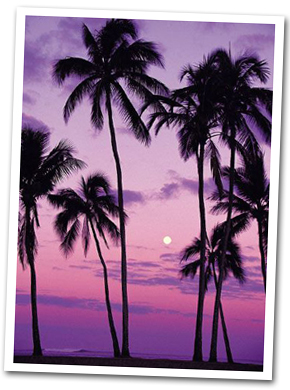 Bring some casual dress clothes or resort wear if you plan on experiencing Hawaii's nightlife. You can buy an Aloha Shirt and flip-flops (or slippers, as the locals call them) when you get here. Hawaii's currency is the US dollar. Traveler's checks aren't necessary since credit cards are widely accepted and ATM machines are plentiful. Don't worry if you forget something. Hawaii's retail stores and malls have everything you need, including plenty of sunscreen. I want to get married in Hawaii. What do we need to do? For any person to lawfully marry in the State of Hawaii, a license for that purpose must be obtained from an authorized agent. Once the license has been issued, there is no waiting period before the marriage can take place. A marriage license and marriage certificate are different documents. The marriage license permits a marriage to take place. The marriage certificate indicates that a legal marriage has been performed. The marriage certificate is prepared and filed by your licensed marriage officiant or performer with the Department of Health. Marriage performers must be duly licensed by and in the State of Hawaii to perform the marriage ceremony. If desired, you may request the marriage performer to present his/her license for your inspection. For further information about obtaining a marriage performer, please contact us. The marriage license application must be filled out (can be downloaded from the website) and filed in person by both the bride and groom. Applications are not accepted via postal mail or email. The marriage license is issued at the time of application and is valid for 30 days and only in the State of Hawaii. The website also has information on Marriage agents or you can call (808) 586-4544. Are there smoking bans in effect in Hawaii? The State of Hawaii has enacted The Smoke Free Hawaii law, designed to protect the health and wellbeing of the people who do not want to be subjected to secondhand smoke. It is not a ban. Smokers may still purchase and use smoke-producing tobacco products in areas other than those designated as smoke-free under the law. This law became effective on Nov. 16, 2006. For more information please visit http://hawaiismokefree.com.